In recent years, there has been an increase in the bore well mishaps wherein children fall into open bore wells. This project aims at designing a system which is capable of rescuing the child with ease and without causing any discomforts such as scratching to the walls of the well. The system is a lightweight, a compact arrangement that has a cable rope to which a deflated balloon is tied, which goes beyond the depth of struck and is inflated. The system is controlled by a rotating rope drum, a cable rope, and a pneumatic gripper. The design of the system is adaptable to the diameter of the bore well which varies from 4 inches to 12 inches. The Depth of Struck and Posture of Struck of the child is monitored through camera using live detector. The project is intended to reduce the time taken to rescue and risk involved in the operation. The project is inclined towards the rescue process, which is technique oriented. The Depth of Struck and Posture of Struck play a key role in the rescue operation, obtained by the Camera interfaced with the live detector. Uninterrupted supply of oxygen is provided so as to eliminate any respiratory issues. Upon determination of Depth of Struck & Posture of Struck, the deflated balloon is sent to a depth beyond and inflated. Upon inflation, cable rope is raised so as to bring the balloon to and it is ensured that the trapped child is seated on the balloon comfortably. 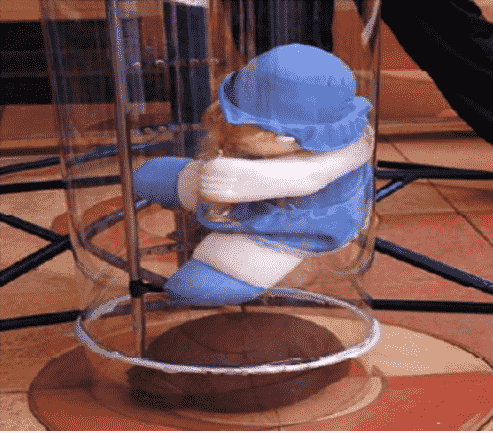 Using Pneumatic Gripper, the child’s body is locked tight and is sandwiched between Gripper & Balloon. The entire sandwiching system is raised gradually so as to ensure safer lifting. The Gripper used in the system can bear up to a weight of 15 Kilograms. The raising & dropping are done by the Rotating Rope Drum, driven by a Motor. The Compressed air is obtained from additional Air Compressor, with which pneumatic gripper works. The lift operation is monitored by the camera. In order to meet the ever-increasing demand for water for industrial, agricultural and commercial purposes, bore wells are dug. With the huge increase in activities, groundwater is not available at all places. This increases the number of borewells with which water is obtained from aquifers present in the lower surfaces of the ground. Most bore wells that are constructed for the pure of water extraction are found in areas where there is human activity, and some of these are unsuccessful in yielding any groundwater. These bore wells are often left open which has been known to be hazardous to human life. The mouths of these constructions are often covered only with polythene sacks or brittle blocks of cement, which are never adequate measures for sealing a potentially hazardous hole in the ground. Children of very tender age tend to fall into these open bore wells and get trapped. Rescuing these trapped children is both difficult and risky for everyone involved with the operation. Evan a small delay in the rescue can cost the child’s life. Additionally, lifting the child out of the narrow confines of the bore wells is a tedious task. Victims often suffer trauma from the fall, either in the form of physiological trauma from being placed highly in the restricted environment over many hours, or physical trauma where they find themselves running out of oxygen which may lead to death. The Bore well Rescue System offers a solution to these challenges. It is safe, economical and most importantly fast. Moreover, it has the capability to monitor the trapped child, supply oxygen and provide a supporting platform to lift them up to the surface level. The system is adaptable to the diameter of the well, less in weight and reduces the complexity of rescue. 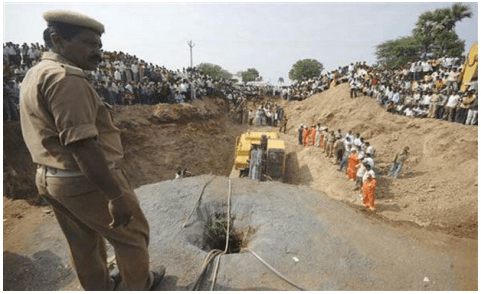 Borewell mishaps are taking place very frequently across the globe. But the number of failures in rescue operations is very high is a case of India. There are many reasons for failures in this context. The Disaster Rescue & Management teams are not equipped with sufficient teams and equipment to lift the child safe from the well. The Common method used to find the depth of a child is with the help of a rope. In normal rescue operation carried out by the Army and National Disaster Rescue Force Teams, a pit is dug parallel to the borewell close to the depth of the child. Then a horizontal path is created to connect the location of the child is caved through. A small delay in the accumulation of different resources for the rescue operation in the existing method will cost the life of an infant. If the area beside the borehole contains rocks below a certain depth, in such cases the chance of saving the child alive is very low. 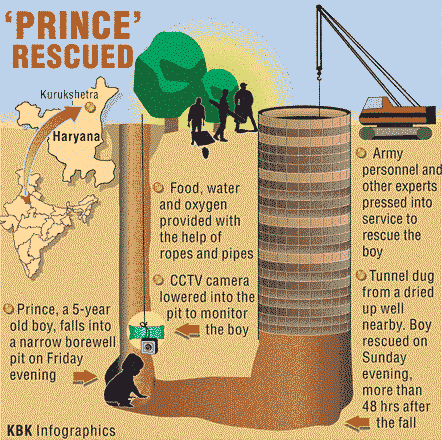 Lack of oxygen inside the bore well and lack of light sources causes the major difficulty during the rescue operation. There is no special equipment for rescuing the child trapped inside the bore well. Not even a proper technique to rescue victims of such accidents. The time taken for the operation is more than 72 hours in most of the cases. Following are some of the details of the bore well mishaps in recent years in India. In most of the cases, rescue operations did not yield satisfactory results. Due to very long rescue operations and traditional techniques followed, infants could not be saved. The following is a list of Bore Well Mishaps occurred in the recent years in different states of the country. Most of the rescue operations did not give fruitful results. Rescue Operations in traditional methods employed are depicted as follows. The following figure shows the case of a child named ‘Prince’. The operation takes back to 2006. This work is aimed at fabrication of a rescue system to work in bore well rescue operations. The system consists of a pneumatic gripper with curvature arrangement, a deflated balloon and surveillance camera with live detection. The gripping mechanism takes hold of the child’s body and lifted up gradually. An entire rescue operation is a process-based approach. Operation begins with determining the Depth of Struck along with the Posture of Struck of the child, obtained by the surveillance camera interfaced with live detection facility. Upon determining both Depth of Struck and Posture of Struck from the camera, the deflated balloon fitted into the cable is passed beyond the Depth of Struck to some extent. 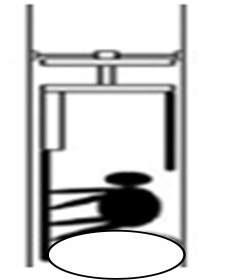 Upon reaching that depth, compressed air is sent through the cable so as to inflate the balloon at that depth and occupy the entire diameter of the well so as to ensure that the baby does not go deep any further as shown. Pneumatic Gripper with the curvature arrangement is then sent into the well close to the Depth of Struck. Upon reaching the Depth of Struck, air compressor allows compressed air to flow into the pneumatic cables to initiate the actuation of the pneumatic gripper. Two arms of the pneumatic gripper move in opposite directions to expand and occupy the entire diameter of the well. The double-acting pneumatic cylinder in the pneumatic gripper in its two positions expands and contracts its two arms. This gives provision to hold the child’s body tight. Upon holding the child tight, the gripper is slowly raised along with the balloon beneath the child. The raising of the child is done slower in order to ensure safety to the child without hitting the sidewalls of the well. 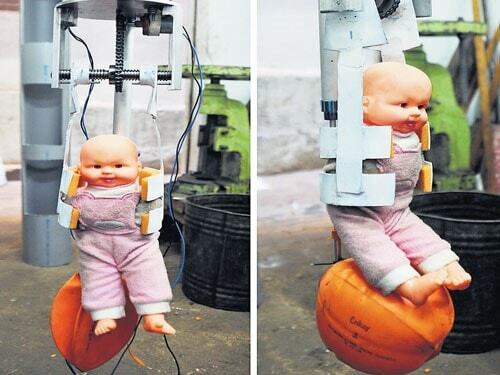 Raising the whole system of a child held in the gripper along with the balloon simultaneously will not harm the child much and also can be done at the very lesser time compared to the existing parallel well technique. This project is more inclined towards the rescue process. This can be summarized as follows. Determination of Depth of Struck and Posture of Struck from Wireless camera interfaced to any Tablet, PC or Mobile Phone. Uninterrupted supply of Oxygen to the child to nullify any respiratory issues. Passing deflated balloon using a cable beyond Depth of Struck. Inflating the balloon using compressed air, through cable so as to allow the balloon to occupy the entire area of the bore well below the Depth of Struck. Ensuring that the child is seated safely on the balloon upon raising the inflated balloon till Depth of Struck. Lowering both Pneumatic Gripper and Holding Attachment assembly to reach the Depth of Struck. Expansion of pneumatic gripper to occupy the area, so the holding attachment. Acquisition of Data from Camera regarding the possibility of hold and separation between the heights of the child and the gripper attachment. Holding the child tight upon attaining constrained conditions. Raising the child held in the gripper attachment slowly to ensure no collision with the side walls of the bore well. The proposed technique can be better understood from the following figures. The system is fabricated using components such as follows. 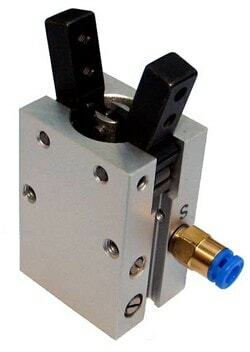 Pneumatic Gripper is a pneumatic actuator, used to hold objects tight with its two jaws. A Gripper is generally used as an end – effector of the robot, that helps in pick and place operations. A Gripper is a device that holds an object so as to manipulate that. It has the ability to hold and release an object while some operation is being performed. These fingers are not a part of the gripper, they are specialized custom tooling used to grip the object and are referred to as ‘Jaws’. External operation of gripping is most followed and most general one. The two jaws of the gripper hold the object’s outer surface tight externally. The internal operation of gripping is used to hold hollow bars from inside which cannot be held externally. In general, while referring gripper to a robot, they are categorized as follows. Jaws physically grasp by direct impact on the object. Jaws are in the form of Pins or Needle like a tool to penetrate into the object being lifted. Grippers using systems such as Suction, Magnetism, Electro – adhesion etc. Gripper uses Adhesive, Surface Tension or freezing to bond to the object. Pneumatically Powered Gripper is most widely used. It is basically a pneumatic cylinder that operates based on compressed air. The cylinder has a piston which moves in two directions upon changing the directions of flow of compressed air. In one stroke, when the piston moves from one position to the other, the object is held tight and in the counterstroke, the piston moves back to the same position it was in the previous stroke. Thus holding and release operations are performed upon changing the direction of flow of compressed air into the pneumatic cylinder. Pneumatic Grippers are commercially available in two ways. In angular pneumatic grippers, two jaws of the gripper move with closure and opening angles. 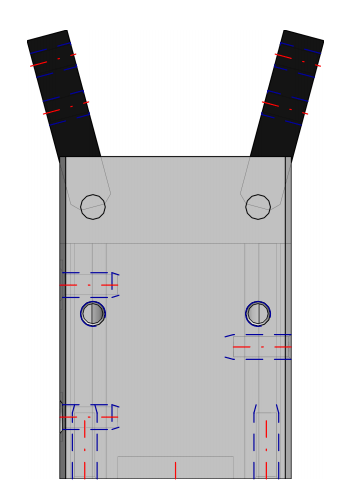 The CAD representation of the gripper is as follows. 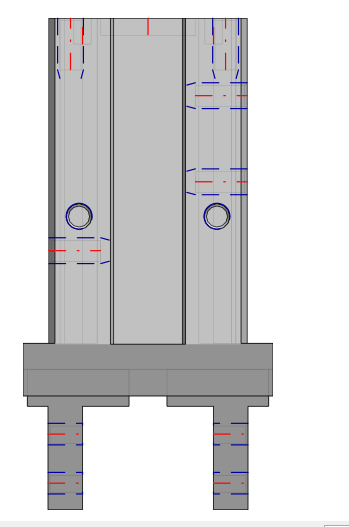 Front view of Gripper gives information about the geometrical parameters such as the width and length of the gripper structure. In addition to the geometrical parameters, specifications regarding the horizontal shift of jaws. Top View of the gripper gives an account of the geometrical parameters of the gripper such as length and width. Side view of gripper gives the details regarding the wholesome length which includes the length of jaws and body. In Pneumatic Parallel Gripper, two jaws move opposite to each other to hold the object rigidly. 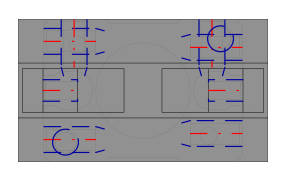 The CAD representation of parallel gripper is as follows. Holding attachment in the project consists of curved jaws, made of soft material which actually takes hold of the child and ensures the rescue. This is the actual gripper that holds the child tight. This is attached to the provisions of the pneumatic angular or parallel gripper, thus follows the position of the gripper as directed. This is designed in “C” Shape so as to have more area of contact thus the gripping strength. Materials used for the fabrication are varied upon required. Generally, Galvanized Iron and Vulcanized Rubber are used to ensure durability and cost effectiveness along with the gripping strength they offer and also their lesser wear. This also gives a cushioning effect to the chill being held at the inner surface as it is coated with galvanized rubber. This will not harm the child in any manner. Safety Balloon used in the project ensures that the child will not go deep any further. The balloon is made of Nylon Rubber which is cost effective and resistant to scratches from the side walls of the bore well. The Balloon is maximum about 12 inches in diameter, which is initially in a deflated condition, arranged in the pneumatic cable which is generally hollow. Compressed Air is passed through the cable to inflate. Inflation takes very less time as the balloon occupies the area of the bore well which is less in general, about 13sq inches (4-inch diameter for commercial pure bore well). It is used to support the child by positioning in the right position under the body. Miniature Camera is provided to determine the Depth of Struck and Posture of Struck accurately. It is a 16 MP HD Night Vision Camera, live interfaced with a PC, Mobile, and tablet, so that it helps in monitoring the situation of the rescue momentarily. The surveillance camera is used to transmit signals to a specific place on a monitor. It differs from broadcast television in that the signal is not openly transmitted, though it may employ point to point, point to multipoint, or mesh wireless links. In industrial plants, CCTV equipment may be used to observe parts of a process from a central control room, when the environment is not suitable for humans. CCTV Systems may operate continuously or only as required to monitor a particular event. CCTV camera connected to the TV tuner. It shows the Depth of Struck and Posture of Struck on the monitor. The Bore Well Rescue System designed and fabricated thus helps in reducing the rescue operation time very effectively compared to any other technique being followed nowadays. It is also observed that the system developed is functional and plays a vital role in saving the child trapped inside a bore well without any harm. The approach thus followed is relatively better than that being adopted. Minute to minute monitoring about the child and about the status of the rescue operation is also possible. The system is designed and fabricated to rescue children weighing between 8Kg and 15 Kg. Following the general guidelines of the Permission Issuing Authority, the bore well has to be 4 inches in diameter for Commercial Applications, 6 – 8 inch for Agricultural Applications and 8 – 12 inch for Industrial and Heavy Industrial Applications. The system is designed in such a way that it is applicable to bore wells of any diameter. The Bore Well Rescue System fabricated thus becomes a big asset in completing the rescue operations successfully without causing any discomfort to the child in any manner. The minute to minute monitoring, slow and steady lifting ensures the safety of the child. Support balloon provided gives support to the child and also makes sure that the child doesn’t go deep any further. The project is supposed to work under real-life circumstances without any constraints. Future developments for the project proposed are as follows. 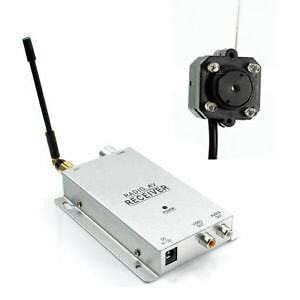 · Usage of Proximity Sensor and interfacing with a buzzer to indicate the hazardous location to anyone coming close to the well. Usage of Servomechanism for holding the child trapped in any orientation with ease. This project would not have been possible without the help and guidance of various people. 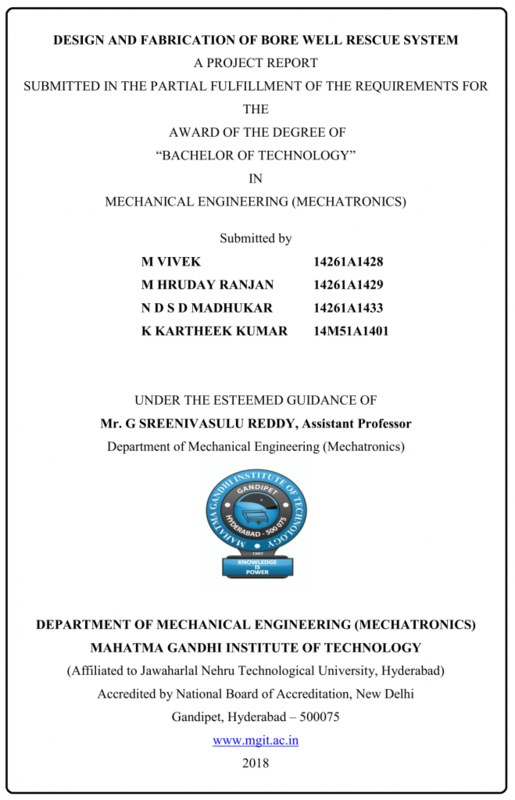 We express our deepest gratitude to Mr. G. SREENIVASULU REDDY, Assistant Professor, Department of Mechanical Engineering (Mechatronics), for his guidance and suggestions at all walks of our work. His support has played a vital role in carrying out the project. We are very thankful to Dr. P. VENKATA RAMANA, Professor, Department of Mechanical Engineering (Mechatronics) for his help and guidance in turning the structure of the project. We are also grateful to Prof. K. SUDHAKAR REDDY, Head of the Department, Mechanical Engineering (Mechatronics) for his inputs during project work which is invaluable. We thank Prof. G. CHANDRA MOHAN REDDY, Principal, Mahatma Gandhi Institute of Technology for the constant support throughout the project.